"I am thinking about biting a politician." This Groundhog Day, we mourn the passing of Winnipeg Willow, who died just 15 days before her moment in the sun (or not—we’ll never know because this year’s celebration has been cancelled). Let us take this occasion to ponder the perils of fame and the joys of ordinary living. Wiarton Willie, Shubenacadie Sam, Malverne Mel, Holtsville Hal, Smith Lake Jake, Dover Doug, Dunkirk Dave, Lawrenceville Lucie, Chatanooga Chuck, Jimmy the Groundhog, and that Kardashian among groundhogs, Punxsutawney Phil, all serve to remind us that there is more to life than photo ops and free carrots. For 364 days a year, celebrity groundhogs live in captivity, typically in zoos. Admittedly, many of these animals were incarcerated because they were deemed unable to live in the wild, and they are better off where they are. But they pay for their home-delivered meals by allowing themselves to be pulled from their burrows one day a year, even if they are still weeks away from the date on which they would have naturally emerged from hibernation. As a species groundhogs are famously introverted -- shy except when threatened, in which case they are aggressive. Not surprisingly there have been at least two incidents in which celebrity groundhogs bit people who tried to hold them up for photographers on Groundhog Day. However, since both masticated persons were politicians, everyone sided with the groundhogs. Career prospects for a celebrity groundhog are dicey. Many CGs are rumored to have been replaced by lookalikes. A couple of communities have tried to replace groundhogs with nutrias. Manitoba Merv is a hand puppet. In 2014, Staten Island Chuck attempted a daring escape while being lifted by the then mayor of New York, Bill de Blasio. Chuck fell six feet, and--many people believe--died of his injuries a week later. Amid allegations of a coverup, Staten Island Zoo claimed that Chuck’s death was unrelated to this fall. The Zoo’s credibility was undermined, however, by the revelation that Chuck had actually been a Charlotte. Incidentally, the real Chuck had previously bitten another Mayor of New York, Michael Bloomberg, which is why the Zoo replaced Chuck with his daughter Charlotte. Mayors of New York ("if you can bite it there, you can bite it anywhere") are no longer allowed to come anywhere near the Staten Island groundhog. While celebrity groundhogs are embroiled in controversy and subjected to untimely annual wakings, your ordinary groundhogs go about their ordinary groundhog lives. Though frequently reviled for eating garden vegetables, groundhogs help other animals by providing abandoned burrows for use as homes. Farmers and gardeners may benefit because these animals eat species that eat more vegetables than the groundhogs do. 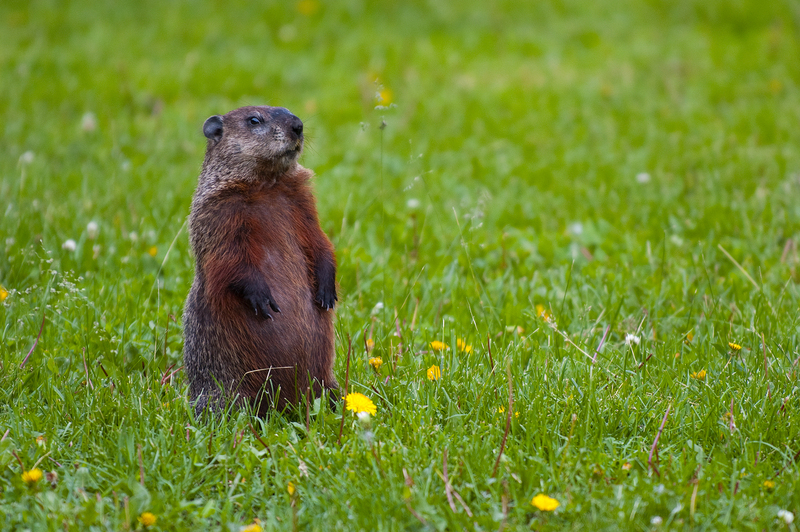 What's more, groundhog burrowing improves the soil. Groundhogs also make cute, amusing visitors to a garden, especially if (as I do) you have one living under your shed. In other words, like most non-celebrities, they deserve a lot more appreciation than they get. Groundhog Day celebrations help to ensure that all groundhogs, even the ordinary ones, are looked upon more kindly by the public. On the whole, I think the sacrifices made by celebrity groundhogs are well worth the price they pay. Groundhog photo copyright © 2004 by April King, aka Marumari, donated to Wikipedia under the GFDL. 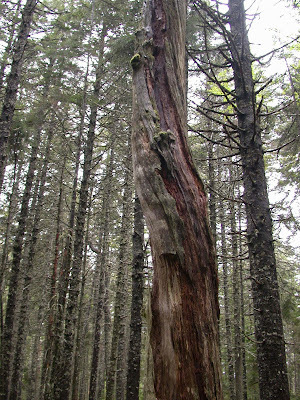 A dead tree, or snag, growing in a remnant patch of old growth forest in Nova Scotia. Photo by Tim Skelly. MANY PEOPLE ARE AFRAID of old age these days. They might feel better if they spent more time around old, dead, and dying trees. In the Q&A section of this blog, which is on the right-hand side of the page, I answered a question from a reader who was wondering whether she should go to a lot of trouble to try to save a much-loved tree from mistletoe. My response was fairly long, but the short version is, Probably not. Why not? Trees are no different from other life forms: Just like us, they eventually get old and/or diseased and die. This can be tragic, especially if the tree is an example of a species under threat from an introduced disease or insect pest. But it doesn't have to be. Old trees show us that there is dignity and grandeur in old age. Dying and dead trees also make a vital contribution to all the life forms around them. Allowing a tree to decline and die with dignity can be a gift to nature and to yourself. Many species of birds and small mammals rely on the cavities that form naturally in dying and dead trees as places to raise young and shelter from harsh weather. The "nest boxes" and "roost boxes" we humans put up are an attempt to provide birds with the equivalent of cavities in dead trees, but most animals prefer the natural cavities if they can find them. Unfortunately, because humans often cut down dead and dying trees, these animals have a tough time finding natural homes. Even a stump of a dead tree has value. As they rot, stumps, fallen logs, and other "deadwood" become natural sponges, soaking up water that they will later release slowly, during dry weather. This helps to prevent flooding. It also provides a perfect environment for the seeds of many species of plants, including new trees, to germinate and grow. This photograph was taken in a patch of old growth forest in the Seattle area. 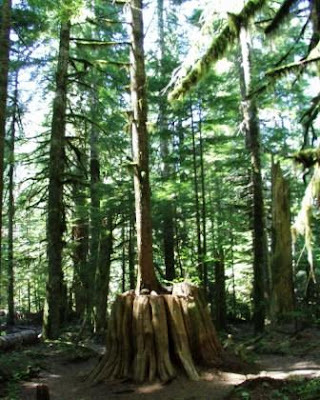 This photo, taken in the Seattle area, shows the remains of an American chestnut. Once common in the eastern United States, this species was affected by an fungal disease that was introduced on imported Asiatic chestnut trees. The disease has killed billions of trees, as a result of which the tree is now extremely rare. The owner of this tree made every effort to save it -- an appropriate step given that the trees are now rare -- but was unsuccessful. It is now incorporated in her garden as a piece of natural sculpture reminding visitors of the dangers posed by introduced species. More natural sculpture: a snag in old-growth forest in Nova Scotia. 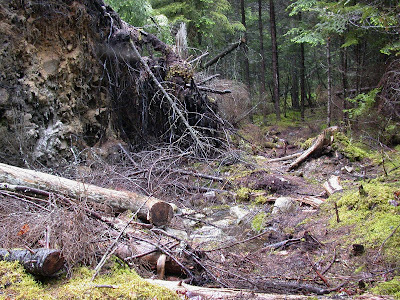 If a big old tree falls in an area inhabited area, the result can be damage to life or property. (So it's important to get a consultation from a trusted arborist if you think a tree might present a hazard.) But these events are natural and beneficial in the forest. The roots of a fallen tree, along with soil and other vegetation that was attached to the roots, are known as the "rootwad" or "root plane." This big mass of soil and decaying plant matter is great habitat for many animals and a good location for new plants to germinate and grow. Photo by Tim Skelly. When a root plane lifts up out of the soil, it often leaves a shallow depression behind. 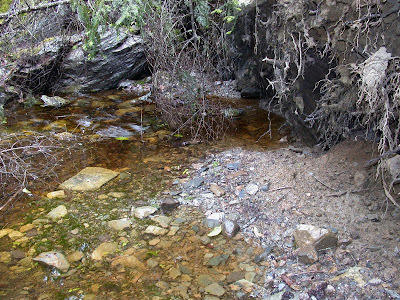 This small, sheltered pond is ideal habitat for amphibians. Photo by Tim Skelly. 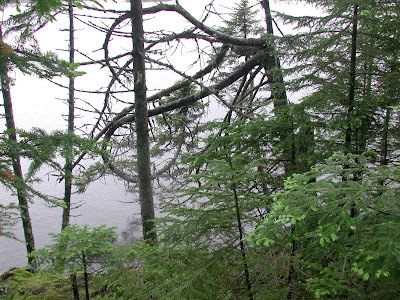 This is the end: This photo shows the forest floor in an area of old-growth forest near to a lake. The open area over the lake exposes this part of the forest to high winds, so many trees have fallen down. 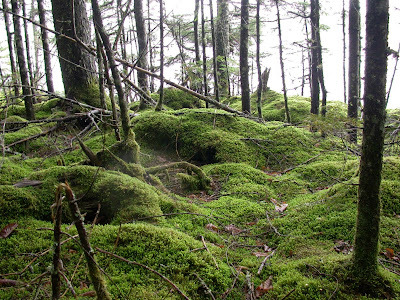 As they decompose and are covered by mosses and other vegetation, the forest floor takes on what ecologists refer to as "pit and mound architecture." The uneven terrain creates a wide variety of habitats, referred to as "microhabitats," that can support different small creatures and plants. Photo by Tim Skelly. SCIENTISTS SEEM TO HAVE SOLVED THE MYSTERY of why bats are killed by wind turbines, and they think they can use this knowledge to prevent bat deaths. This good news comes from the Journal of Wildlife Management via Science Daily: Bat deaths can be reduced by making sure that the blades of the turbines do not turn (at least not much) when wind speeds are low. Taking this precaution doesn’t significantly affect energy output from the turbines, either. The idea is already being successfully used in some locations. My earlier post on windpower and wildlife can be found here. For the record, a (“up to”) 60% reduction in bat deaths isn’t enough to make me ultra happy about the popularity of wind power. But it is good news, and perhaps this discovery will lead to others that will reduce bat deaths even more. Many thanks to Carole Browne of Conservation Gardening for mentioning this news on her blog. WHILE WE’RE ON THE TOPIC of good news, check out this article from Fine Gardening magazine. Here we have a well-known garden writer, writing in a mainstream gardening magazine, advising readers to stop tilling their soil! Mind you, natural landscapers have known everything in this article for a decade or more. In fact, I confess that a small part of me is miffed when mainstream writers suddenly “discover” practices we’ve been using for ages, and don’t mention that these ideas are not new. Still, I try not to give in to that tiny, mean-spirited part of this complete personality, and instead take joy in realizing that these practices are … can it be? … is it possible? … actually starting to be looked upon as … acceptable? Even desirable? Articles such as this one, and other good news, give me reason to hope that this may actually be the case. A COUPLE OF YEARS AGO, I blogged about the depressing case of Deborah Dale, a past president of the North American Native Plant Society whose Toronto garden was destroyed by over-zealous officials who did not understand or appreciate her natural landscaping. So imagine my joy upon checking the NAPS website this morning, to discover that a couple in Ottawa just won a battle to preserve their own half-acre meadow of pollinator-friendly plants! On July 25, 2009, the Ottawa Citizen reported that the city of Ottawa had rescinded a bylaw that would have forbidden Hank and Vera Jones from retaining their environmentally friendly, wildlife-friendly plantings. THIS IS A MISERABLE TIME of year for many allergy sufferers. Unfortunately, people with allergies often blame the wrong plants, which does nothing to relieve their suffering and may prevent them or even their neighbors from planting harmless species. Left, the pollen of Common ragweed causes most respiratory allergies at this time of year. This photo is by Forest and Kim Starr, via the Wikipedia Commons. As it happens, a wildlife-friendly garden is likely to be an allergy-sufferer's best friend. Why? Because plants that are pollinated by insects tend to have heavy pollen. Because it’s heavy, this pollen is not carried on the wind, which means that it does not have a chance to get into your nose and start the immune-system reaction known as an allergy attack. So a wildlife-friendly garden full of flowers that are being visited by butterflies, bees, and other pollinators is not likely to cause allergic reactions. In late summer, the chief cause of respiratory allergy symptoms is ragweed (Ambrosia artemisiifolia). This is an annual weed that’s common in the Northeast, Midwest, and South. Although it’s native to North America, I’ve never heard anyone recommend it as a garden plant! Ragweed pollen can travel hundreds of miles but most of it lands near the plant, so the closer the plant is to you the more likely it is that the pollen will end up in your nose. If there is any ragweed growing near you, the best way to dispose of it is probably to wet it down (to make the pollen grains heavy, so they don’t scatter), then cut it back carefully and again carefully put the stems into a plastic garbage bag, which can be put out with the trash. The best time to do this would be early on a chilly morning, when pollen production would be at its lowest. For future years, the best way to keep ragweed off your property is to plant aggressive perennials, preferably ones that are pollinated by insects, because these plants can prevent the annual ragweed from getting a foothold in your garden. In other words, have a wildlife-friendly garden! Goldenrod might be a good choice because it is insect pollinated and extremely aggressive. One warning: People who are allergic to ragweed pollen may also be allergic to the pollen of other plants in the Aster family. Now, the Aster family is huge and includes many wonderful wildlife-friendly plants with heavy pollen, including Goldenrod and Purple coneflower. It would be a tragedy for any wildlife-friendly gardener to give up these plants altogether. But if you are allergic to ragweed, you may want to plant these species further from your house and avoid bringing the flowers into your house or working right next to them during pollen season. Sniffing the flowers of plants in the Aster family would also be ill-advised, as that would pull even heavy pollen into your nose. Meanwhile, here are a few ways to keep allergies under control this time of year. Most of them come from the American Academy of Allergy Asthma and Immunology. Try to stay inside with the windows closed when pollen counts are high. This is generally between 10 am and 4 pm on dry days. (Rainy days are safer because the rain washes the pollen out of the air.) You can get local pollen counts from the National Allergy Bureau at (800)-9-POLLEN, or http://www.pollen.com/. An air conditioner helps because it cools and dries the air, an HEPA filter can clean the pollen out of the air. And of course you need to avoid anything that would stir up pollen or bring pollen into your house during pollen season, from raking leaves to hanging clothes outside to dry (because pollen collects on the clothes). If you've been working outside, change your clothes when you come inside. If you do go outside when pollen counts are high, you could try wearing a pollen mask. Another tip is to keep your bedroom closed up during the day and then bathe before you go to bed. This will prevent pollen from getting into your bedding. Also, I'm sure any allergy sufferer who is willing to take drugs has already tried all the over-the-counter drugs, but have you tried nasal rinsing? This will wash pollen grains out of your sinus cavities. Here are instructions from the AAAAI. Above, a scene from my deck during the summer. We had at least six of these guys drinking from 5 feeders, which I had to refill 2-3 times a day. That thing in the background is the tower that delivers our high-speed Internet service—not the prettiest thing in the landscape, but we do love having high speed. AS I WRITE THIS, it’s September 1, and I still have at least one hummingbird coming to the feeders of the six or more that came constantly throughout the summer. Instead of having to fill five feeders at least twice a day, I now am down to three (the last storm having blown down and smashed two of them). I go on filling them daily to make sure the food is fresh, but the feeders are usually not empty when I do fill them. Wherever you live, if you feed hummingbirds at all it’s a good idea to leave the feeders out and keep them filled with fresh food at this time of year. This will help your own birds, who most likely will come back to you next spring, “make weight” for the big migration that’s ahead of them. It also provides food for hummers that are stopping over on their way south. Some sources recommend keeping feeders up for at least two weeks after you think you’ve seen your last hummingbird of the year. My goal is to help you create and enjoy a garden that will be good for you, good for the planet, and good for all the critters, human and otherwise, that visit it. I’ve lived and gardened in Chicago and the Seattle area, and now I live on 250 acres in eastern Canada. Most of my life has been spent as a journalist and editor, but after moving to Seattle I took a detour and ended up designing and installing wildlife-friendly gardens. For a long (sorry) but (I think) funny essay about this experience, please click here. In this blog, I try to combine my gardening experiences with journalism-type research to come up with items that I hope will be useful to you, the gardener who wants to be kind to wildlife. The blog will probably be most useful to people living in areas where I have some practical experience, namely the band of states and provinces that are on either side of the United States-Canada border. Being self-employed, I go through spells when I’m self-unemployed and am able to post frequently, and spells when I’m involved in a project and not able to post. This site is a labor of love and, alas, like so many labors of love it often has to take a back seat to labors of lucre. If you like what you find here, please consider joining the site as a member or adding it to your “follow” list. The modules for this are below. Answer: Dear Mary, old is not ugly, dying is not bad, and dead is part of the natural order. At least if you're a tree. Old, diseased trees, and the dead trees they eventually turn into, play just as important a role in an ecosystem as the young, healthy ones do--even more important because, thanks to the misguided practices of the past, dead and dying trees have become so rare. Holes in dead and dying trees are vital nesting spots for many birds and small mammals. Dead branches and other litter (which is not necessarily a sign of disease--healthy trees drop litter too), if left to decompose naturally, are also important for ecosystem health. When working with old trees it's important to get advice from an arborist who understands their value and won't be in too much of a hurry to make drastic changes. Before hiring an arborist, I'd ask him or her to explain the ecological value of dead and dying trees. Ideally I'd want to work with an arborist who could show me examples of dead or dying trees he/she has left standing (aka snags). I don't know much about mistletoe because I've never lived anywhere that it grows, but I wasn't surprised to read in the Wikipedia that it is an ecologically important species. All too often, valuable native species are classified as pests just because they don't fit preconceived notions of attractiveness. To me it sounds like a pretty cool plant and one I would be happy to have in my garden. All in all, as long as the tree doesn't pose a hazard to people or property (the advice of a professional could be helpful in making this decision), I would leave it alone to live out its life in dignity and peace. If the tree does pose a hazard, I would look for an arborist who is willing to do the least amount of work necessary to remove the hazard, making every effort to leave as much of the tree as possible and not destroy its appearance. Looking for a question and answer that appeared here previously? I am archiving them at my new website. Currently you'll find one question and answer about how to get rid of a multiflora rose and another about how to move a bumblebee nest. I believe that what homeowners do with their property is important, both for the health of the neighborhood and for the future of the planet. But I also believe that human beings in general, and gardeners in particular, really need to stop worrying so much. For a long but funny article I wrote on this theme, click here. For tips and products to help prevent birds from flying into windows, go here. For my recommendation for best hummingbird feeders and other information about feeding hummingbirds, start here. Why Do Hummingbirds Like Red Flowers? Have You Seen These Bees? Where Do Little Birds Sleep in Winter? Do You Have to Feed Birds All Winter? What Type of Seed Should You Put in Those Feeders? I generated these terms using a service available at this website. I modified it slightly to meet my own needs. Thanks to Ben Nadel for providing this service. By accessing this blog, you are agreeing to be bound by these Terms and Conditions of Use, all applicable laws and regulations, and agree that you are responsible for compliance with any applicable local laws. If you do not agree with any of these terms, you are prohibited from using or accessing this site. The materials contained in this blog are protected by applicable copyright and trade mark law. This license shall automatically terminate if you violate any of these restrictions and may be terminated by Wild Flora's Wild Gardening at any time. The materials on Wild Flora's Wild Gardening's web site are provided "as is". Wild Flora's Wild Gardening makes no warranties, expressed or implied, and hereby disclaims and negates all other warranties, including without limitation, implied warranties or conditions of merchantability, fitness for a particular purpose, or non-infringement of intellectual property or other violation of rights. 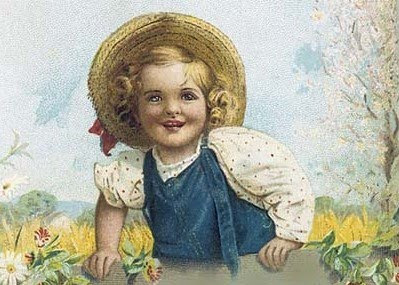 Further, Wild Flora's Wild Gardening does not warrant or make any representations concerning the accuracy, likely results, or reliability of the use of the materials on its Internet web site or otherwise relating to such materials or on any sites linked to this site. In no event shall Wild Flora's Wild Gardening or its suppliers be liable for any damages (including, without limitation, damages for loss of data or profit, or due to business interruption,) arising out of the use or inability to use the materials on Wild Flora's Wild Gardening's Internet site, even if Wild Flora's Wild Gardening or a Wild Flora's Wild Gardening authorized representative has been notified orally or in writing of the possibility of such damage. Because some jurisdictions do not allow limitations on implied warranties, or limitations of liability for consequential or incidental damages, these limitations may not apply to you. The materials appearing on Wild Flora's Wild Gardening's web site could include technical, typographical, or photographic errors. Wild Flora's Wild Gardening does not warrant that any of the materials on its web site are accurate, complete, or current. Wild Flora's Wild Gardening may make changes to the materials contained on its web site at any time without notice. Wild Flora's Wild Gardening does not, however, make any commitment to update the materials. 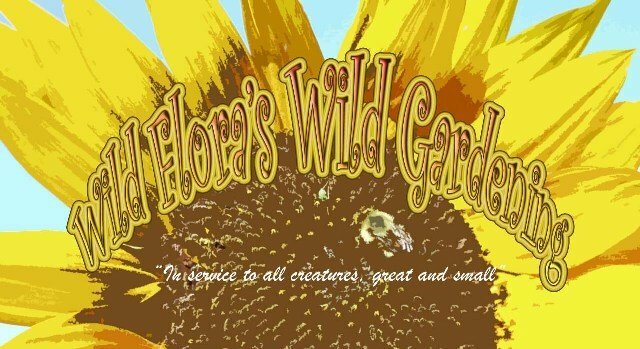 Wild Flora's Wild Gardening has not reviewed all of the sites linked to its Internet web site and is not responsible for the contents of any such linked site. 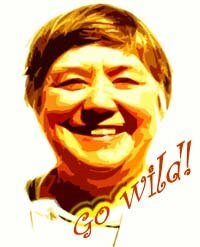 The inclusion of any link does not imply endorsement by Wild Flora's Wild Gardening of the site. Use of any such linked web site is at the user's own risk. Any claim relating to Wild Flora's Wild Gardening's web site shall be governed by the laws of Nova Scotia, Canada, without regard to its conflict of law provisions. Pollinator Conservation Handbook by M. Sheperd, S.L. Buchmann, M. Vaughan & S.H. Black pub. 2003 by The Xerces Society, Portland OR.